Last week, I started 37 projects. That’s kinda how I roll. And I should have learned by now that when I do that, I end up sick. So, now I have 37 half finished projects and raging bronchitis. And our family Thanksgiving just happens to be Thursday—-at my house. I am blessed to have been able to hire a painter who’s coming today to help me finish. But I’ll show you a few pics from the week and we’ll all cross our fingers that we get all our ‘stuff’ done in time to relax and enjoy our families. Keep in mind, NOTHING is finished. And while I coughed and painted, the little girls played a lot of American Girl fantasyland and the ‘big’ girls made the cutest shirts. 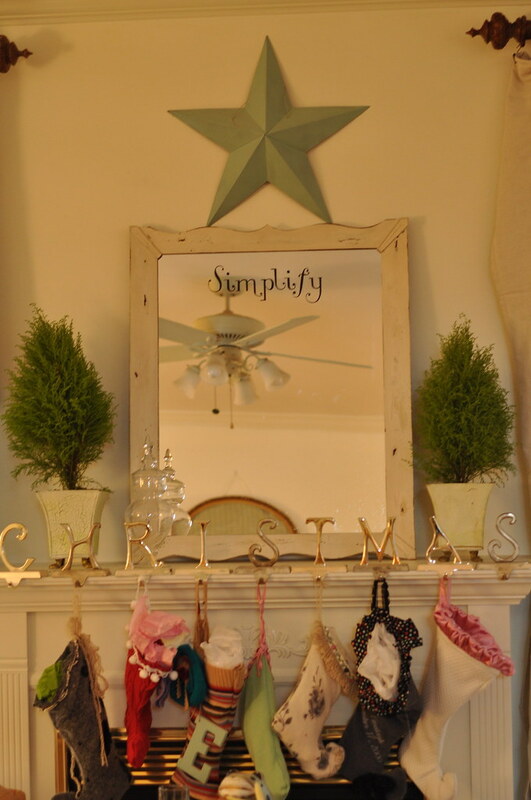 a spruced up mantle for Christmas–did I emphasize unfinished? Check our my tumblr site for a peek into some of the yummies I’m making——in between coughing and painting. I promise I’m not coughing in the food. My brother in law may no-show when my sister reads this post to him. And for finished Thanksgiving projects, visit Clover Lane! Whether the projects all get done or not, this I know: I am profoundly blessed, beyond anything I could ever hope for or ask. And I will pray for a heart of thankfulness, for myself, for my family and for you. Oh gosh, get well soon! 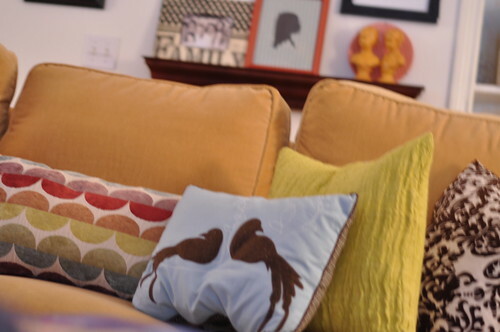 I'm loving all of the colors you are bringing into your home- everything is looking great so far! The mantle project is clearly misiing a few layers still to be an edie original! Love the paint, love the mantle, love it all!! And I very much wish that I could bring you dinner and help you paint. Do you know how big I smiled seeing Kit Kitteridge? It's kind of laughable… but that little doll makes me smile so big. Morgan loves her so much and I think she's such a sweet little doll! Ok, get yourself rested up… and good for you on hiring a painter!! Can't wait to see it all come together! I love the new paint color in the girls' room… do you mind sharing what it is? Hope you feel better quickly! Nothing like starting a million things only to get sick. Everything looks great! And remember the words of Nester, It doesn't have to be Perfect to be Beautiful. Everything looks great so far! Love the paint color on the bed! And love the stockings! Hope you feel better soon! We just painted a bedroom chocolate brown and I hated it, but now, I think I will work on it and love it. You have been very busy and everything is looking great, half-finished or not! I love the stockings. if i lived near enough to you…i would bring you some chicken soup and help you finish your projects! i just finished painting my daughter's room last week. love all that i see! Those chocolate walls are beautiful. I can relate to starting a bunch of projects at one time, but then something comes up to postpone the completion! 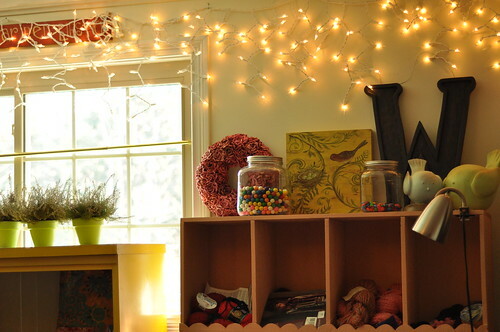 I'm so jealous of your craft room!! That ampersand you have over your bed (you know…the "&")? I have it. I covered it with scrapbook paper, along with our first initials, and displayed them at our wedding. I've been wondering what to do with it, and now I think I may need to find a place for it in the bedroom. Also, where did you get those prints in the girls room? They are fantastic! Oh Edie…I LOVE your bedroom…and I think I may have now decided what to do my own bedroom in…I have gobs of "coffee bean" from Lowes leftover from my kitchen….just haven't been brave enough to pull the trigger on such a large wall. Would love to know the color you picked for the girls room….very pretty. I pray you are able to rest up and heal before your Thanksgiving Feast. Your projects are beautiful even when they haven't been completed 100%…Enjoy your family! awww, hope you feel better. love the birdie pillow, and your daughter's talent for t-shirt making… have you seen the jcrew line of t's this fall… reminds me of that. i am the queen of unfinished… but i have no excuses! you make me tired, just reading all that you tackle. all the time!! see you on the circle! 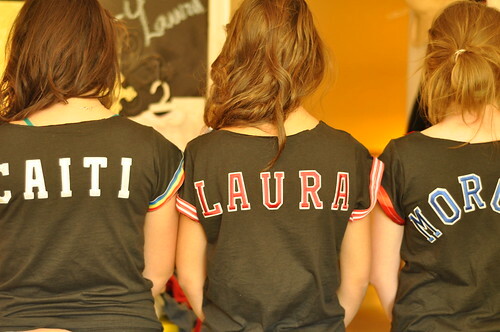 Love all of the COLOR in your home and the girls shirts…ROCK!! if ya wanna come see my partial kitchen redo, stop by. Love the chocolate brown walls. I am also still dreaming of your craft room! My daughter has that same bed and I love how it looks painted! What a beautiful home! I need to paint. I dread it. I really need to hire someone because the area over the stairs extends to like 20'! Dh is unemployed though & it's not going to happen real soon though. Maybe if he finds a job &we have to move? Do you know of anyone that needs electrical/facilities engineers? Oh my – I want to be you when I grow up! Your house, colours, knack of putting things "together"….wow! Particularly love the line of stockings at your mantle! LOVE the mirror…and the stockings….and the red bed….and the girl's tee shirts, and…….EVERYTHING! Happy Thanksgiving! I hope you are feeling much better soon!! Great ideas going!! I hope you are able to finish everything you have going and can relax and enjoy your family. I think your mantle looks great. I love the letters above your headboard!! I hope your feeling better VERY, very soon. I love the lights in the craft room, and the new art for the girls room (super cute), and I LOVE the new color for the beds. I wanted to let you know that I've tagged you with an award for a being a blog that brightens my day. I'm sure you get these alot, but I couldn't pass up the opportunity to recognize you and your blog since you are one of my favorites. I hope you'll stop by and check it out. oh my ..just came upon your blog and I bow down to you. Have always homeschooled but that's it, besides knitting my life away. But the last kid is almost off to college, and I want to mess/fix things up around here! 1) what WAS that energy drink from Feb 09 that you drank? 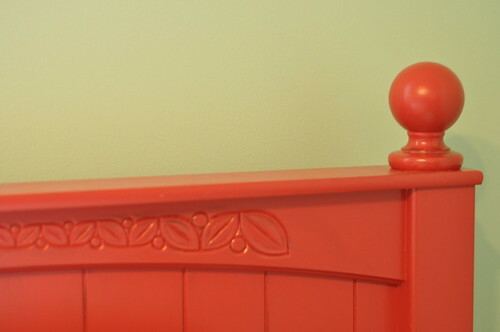 2) what is the color of the kids' bed? it's gorgeous! I love red and all its possibilities. 3) cannot think of another thing, but need more energy to make the Thanksgiving fixings, do my mother's wedding 2 days after that and have a craft show a few days after that! ARRGGGG! I want to crawl up into a ball and hide. Wow. I'm way impressed with your home. Everything is SO beautiful! 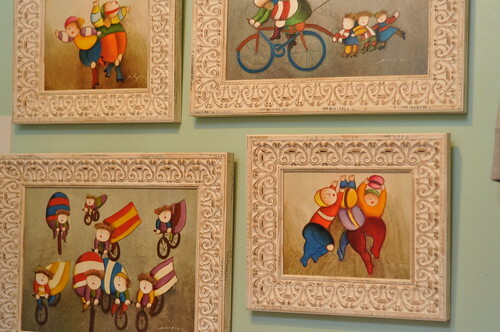 I'm fairly new to your blog and you've left wanting to see more pictures…like the whole house. Your unfinished is way beyond my finished. Hope you feel better and have a Happy Thanksgiving. 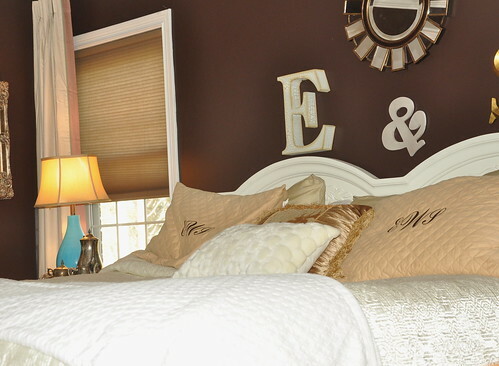 Also, I would LOVE to know what paint color you used in the brown bedroom…? Its a great color. Ive been trying to find the perfect brown. Can you come to MY house?? 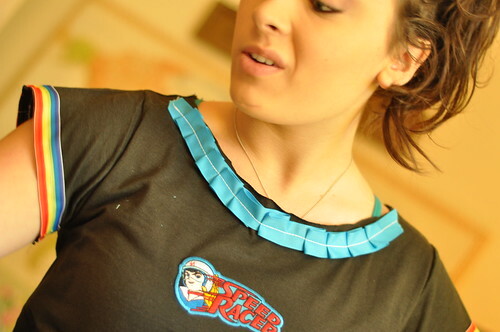 😉 I think I am "SuperWoman" if I start and finish 2 projects in a week… much less 37!!!! You ROCK!!!! Get Well and have a Wonderful Thanksgiving!!! Lovely place to visit! The authenticity and love in all the little nooks and crannies are delightful.